Earlier in February I had the pleasure of recording an oral history interview with Athol Willoughby, former dancer with the National Theatre Ballet and other companies, and an esteemed Melbourne-based ballet teacher over several decades. Tasmanian-born, Willoughby first took up ballet in Hobart with Beattie Jordan but soon moved to Melbourne to further his training at the National Theatre Ballet School under the direction of Lucie Saronova. Saronova played a particularly significant role in the early days of the Cecchetti Society in Australia and Willoughby recalls her fondly and discusses her teaching and her role in Australian dance history throughout the interview. 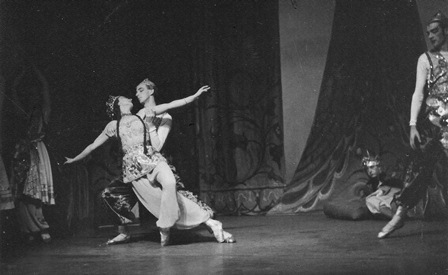 Willoughby joined the National Theatre Ballet in 1952 and worked with two directors of that company—Walter Gore and Valrene Tweedie. Following a stint in the United Kingdom, where he took classes from a range of well-known teachers including Anna Northcote and Stanislas Idzikowski and performed with Western Theatre Ballet, he came back to Melbourne and devoted himself to teaching. He returned to the professional stage twice with the Australian Ballet—in a revival of Anne Woolliams’ Swan Lake, and as one of Clara’s émigré friends in Graeme Murphy’s Nutcracker: the story of Clara. Willoughby has always maintained strong connections with the Cecchetti Society. He taught Cecchetti technique, is a holder of the Cecchetti Diploma and was one of the most senior examiners for the Cecchetti movement in Australia. He also prepared a number of now highly-respected Cecchetti examiners for their role as examiners, namely Sandra Allen, Lorraine Blackbourn, Anne Butler, Sandra Clack, Carole Oliver and Jennifer Stielow. The interview is significant from so many points of view. In particular, it contains considerable background to and information about the National Theatre Ballet, a company that has been somewhat neglected, I think, in present day Australian dance scholarship. The interview is also full of delightful anecdotes about life as a dancer and about the personalities with whom Willoughby came into contact in Australia and elsewhere! The catalogue entry for the interview on the National Library of Australia’s catalogue is at this link. I hope in due course it will be made available as an online resource. It is well worth listening to and highlights how important oral history is in the recording of Australia’s dance history. So much of what interviewees give us through the medium of the oral history interview will never be recorded in any other way. All photos reproduced are from the personal collection of Athol Willoughby. Thank you Michelle. A much needed addition to the NLA catalogue. I do hope that it will become an online resource. I was very fortunate to have commenced my dance training in the early 1960s with Mr Willoughby. To this day he is still my mentor and friend. For visitors to this post who may be interested in hearing the interview with Shirley Andrews it is available online at this link. Martie, you must be related to the interviewer, Wendy Lowenstein?